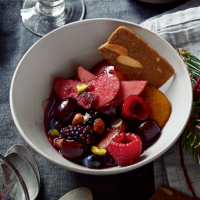 When a quick and easy dessert is required, this special fruit salad is just the thing - it can be ready in 20 minutes. Put the wine in pan with the sugar, spices, orange zest and juice. Heat gently, stirring until the sugar dissolves then bring to the boil and simmer for 5 minutes until syrupy. Meanwhile, stone and slice any large fruit such as plums and halves and stone the cherries. Place the prepared fruit in a large bowl and pour over the ho syrup through a sieve. Discard the spices. You can return the cinnamon stick to the syrup if you wish. Stir the fruit to coat in the syrup then cool slightly. Spoon the compote into bowls and sprinkle with the berry and nut mix. Delicious served with crème fraîche and biscuit thins. Make and cool the compote then chill for up to 24 hours before continuing from step 3. Reheat gently if you wish.